The Los Angeles Times says The Sopranos “made serialized storytelling manly.” OK. The waitresses probably don’t even know who he was. 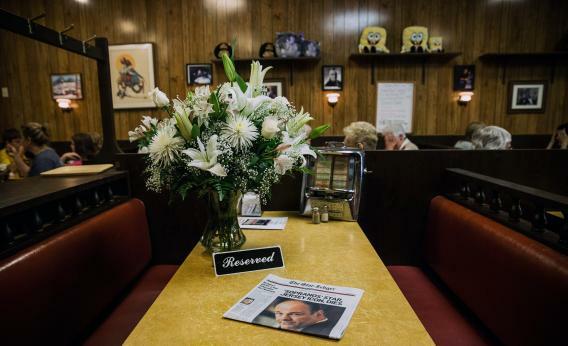 In the wake of James Gandolfini’s sudden and untimely death last week at 51, thousands of words, many of them beautiful and heartfelt, have been published in his memory. But some observers have jumped to rather odd conclusions, including Los Angeles Times critic Mary McNamara, who throws out television history to suggest that The Sopranos somehow made it OK for men to talk about television. I suppose that “not feel like a geek” is McNamara’s attempt to distinguish The Sopranos from Star Trek, which has had a hugely active and significantly male fan base since the 1960s. A decade before the debut of The Sopranos, Matt Groening created The Simpsons, though maybe that’s disqualified on geek grounds, too? When J.R. Ewing was shot, did only women care? One thing’s for sure: I’ve never heard a guy quote Seinfeld. “The Sopranos” made serialized storytelling manly. Suddenly it was cool for even those men who deplored the metrosexualization of everything to follow a TV show avidly, raptly, and in communion with other men. Wait, so did The Sopranos metrosexualize TV or not metrosexualize TV? I’m not following. McNamara’s idea, presented entirely without evidence, that The Sopranos somehow let men bust out of the television-watching closet seems more like a stretch for a second-day story than proof of an epochal shift in television viewership. The Sopranos did herald a new era of obsessive TV watching, both for regular viewers (men and women) and for the burgeoning episode recap business from which so many of today’s television critics (female television critics prominently among them) sprung. To distill its impact to some sort of male bonding exercise belittles the show and its audience. And it ignores a whole lot of television history.